A simple, but really tasty sandwich. Perfect for lunch. As S says, this sandwich really makes one appreciate the taste of olive oil. Slice the baguette to the desired sandwich size. Then, slice that in half, horizontally (but not completely, so it can hold all of the ingredients inside). Drizzle a little bit of olive oil on the inside of each baguette half. Add the slices of prosciutto and mozzarella, and add a little bit of salt and pepper to taste. Top with the arugula and sliced tomatoes, and then eat! -Wednesday, August 3, 2011: In preparation of S’s successful trip to the DC Federal Circuit. 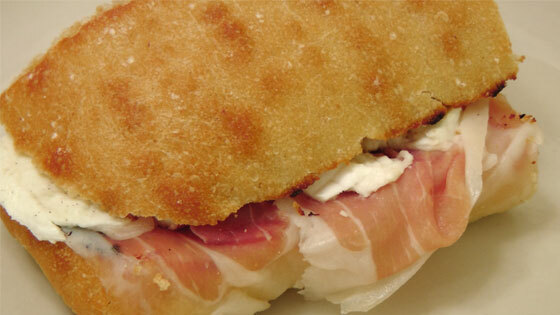 This entry was posted in Main Dish, Recipes and tagged Mozzarella, Prosciutto, Sandwich. Bookmark the permalink.